Yesterday, both counts expected more downside, which the market provided. The picture has clarified just a little bit, and, as I see it, there are two main options for the short-term resolution. What's interesting about this market is that it's managed to grind lower without reaching any extreme levels in bearish sentiment, or extreme oversold readings in certain key indicators such as the McClellan Oscillator (NYMO). As long as this situation persists, it is completely plausible for the decline to continue essentially unabated. It seems everyone is looking for a bounce, and I must admit I'm starting to look for one as well. But when everyone's expecting a bounce... well, you know how I feel about the situation where everyone's looking for something. Generally speaking, the more people who are expecting a certain outcome from the market, the less likely that outcome becomes. This occurs for the simple reason that people position their trades in anticipation of what they believe is coming -- so if everyone's looking for a strong decline, then most traders have either already sold, or are positioned short -- which in turn means there's no one left to sell to drive the market lower. The same applies in reverse for rallies. The majority of traders simply need to be on the wrong side of the trade for a strong move to occur in either direction. Keep that in mind next time you're on the wrong side of the trade: so was most everyone else. Accordingly, I've prepared only two charts today, in an effort to keep things a bit simpler than yesterday's article. I searched through approximately 20 charts, looking for a Holy Grail to unlock the market's intentions, but came up with nothing. Virtually all the charts seem to be showing the same level of veiled intentions. The first count I'd like to share examines the possibility of an a-b-c expanded flat to complete wave ii. The market left this option on the table at Monday's close by failing to form a complete 5-wave decline. The decline is currently 3-waves, and it may or may not stay that way. Obviously, I can only see what's actually present in the charts each day. 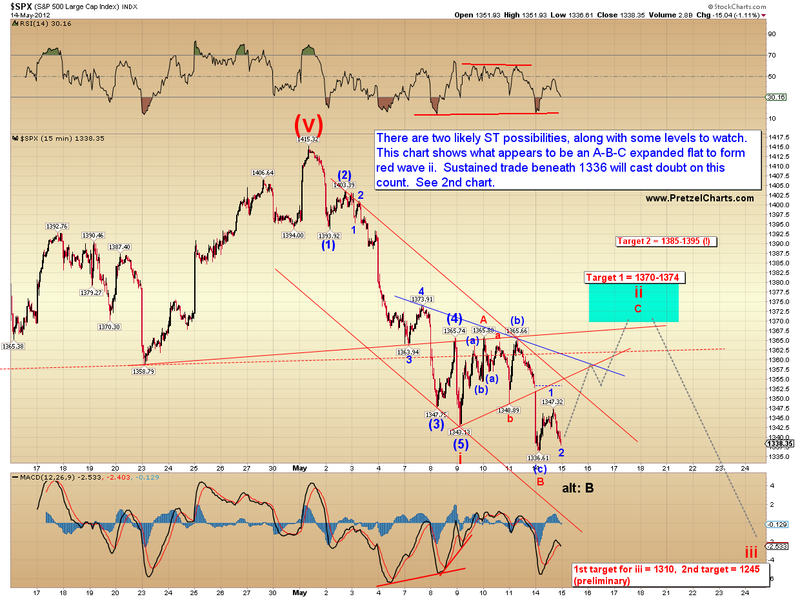 If the decline goes on to form another new low, that will give it a 5-wave structure (see 2nd chart). I'm favoring this resolution, primarily because I feel that red wave ii needs to consume more time before completion. The second chart examines a much more immediately bearish view. This remains viable because, as discussed, there is absolutely nothing screaming for a bottom here. Usually we would expect some extremes in either sentiment or reliable oversold indicators before seeing a trade-able bottom. The chart below also quietly notes the possiblity of wave (5) sneaking in near the 1330-1335 zone (shown in black, "alt: (5)"). In this regard, I'd suggest watching the lower blue trend line/channel. If the market blows through that line, then there's probably more selling ahead, since the inability of bulls to hold that level would indicate renewed selling pressure. I continue to believe this market is in a much more dangerous position than is commonly being acknowledged. I suppose that's how it needs to be -- once again, if everyone's on the lookout for something, it rarely happens. 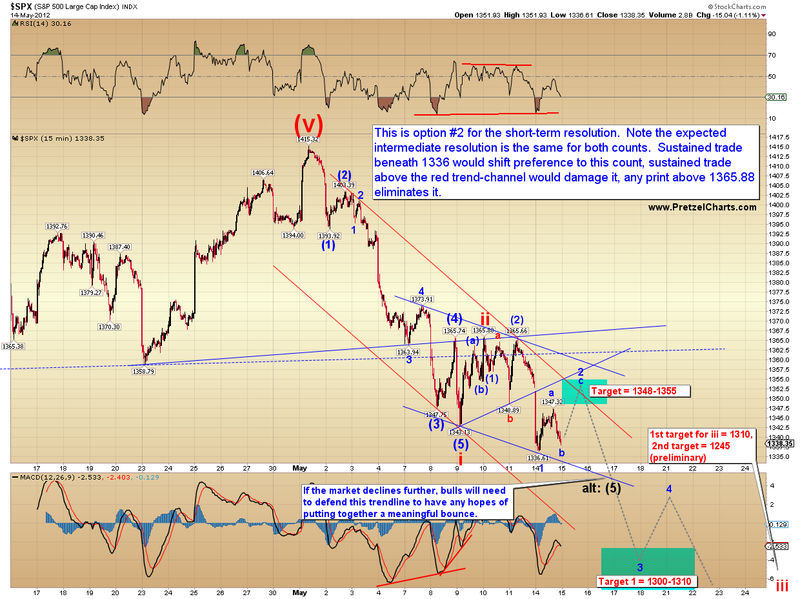 In conclusion, there are some key levels to watch for clues on Tuesday, and potential targets for each count. Note that both counts continue to believe the intermediate trend is now down. Trade safe. Reprinted by permission; copyright 2012 Minyanville Media, Inc.
Oooh, done before midnight. With the wife and kids out of town, I can work without breaks! I'm not sure this is a good thing. Whoa Nellie, I answered your question on the prior thread. 30 minute Discus blackout? Appears Europe attemting a snapper, EUR/$ up, US futes holding Katzo's breakdown points. Fade an up open for a long? Interesting! In case we see bulls push those different , bulls might take control - but for now bears still in full control. Appreciate it, out at 43, +2.5. I will feel more confident shorting at 1355/70 then going long here. Good post today, PL. I hit the 'like' thumbs up but had to check the 'i like pizza' check-box just to do something different this time. I'm looking for a good entry point to go short with real money - the top of red ii would be a great place to do so from the looks of things. On the RUT that would be about 805 -810 but will wait for a turn anyplace over 799 (expecting a weak red ii). hmmm, no it wouldn't be a good thing IMHO. Family time is very important, I hope you didn't *opt-out* of the vacay in consideration of the blawg. Even Obama has made sure to take *plenty* of time outs with the family...even if they get there seperately. Rhetorical question: When one lives in Hawaii (aka Paradise Island) where does one vacation to "get-away-from-it-all"???? Thanks for the advice...this market thing is just so damned interesting. Been stingy lately as I'm not nursing right now...just running the bidness. Really good money for the time required but boooooring. I just have to get the hang of budgeting my time in a more productive manner, so I can do the more important things...da Mrs. and little dude (he's a trip...and smarter than me). Keep banging on that screen...If ya need any help, I'll send my buddy over. CVX will look real nice to short as a flat. No, you don't owe div, but the expected price drop of div in the stock is already priced into both put and call options. Was that a diamond-top pattern around the SPX 1422? Alright, let's see a show of hands: should I send this one to Minyanville or not? Yes, a good article. Send. GREEK ANTI-BAILOUT CONSERVATIVE KAMMENOS SAYS THERE IS NO DEAL ON GOVERNMENT -BBGKAMMENOS SAYS "THEY PREFER CREDITORS TO NATIONAL SOLUTION"
PL, looking at the es now, maybe the ii is indeed finished? don't try to fake ou the katzo ! Near the head and shoulders breakdown target on the one-minute chart. I jumped back in short immediately. Always send when you have the little yellow target boxes. Works for me. Well that really knocked the snot out of the indices....They got gyro'd. Move to Spain or Greece. Cheap! That way you'll be 6 hours ahead instead of 6 hours behind. eur/usd needs to hold the line here or it's going to make new lows. Same likely goes for ES, they've been trading in concert lately. Any bets on the level the S&P has to go down to for "the beard" to crank up the old printing press? ~1300? re entery on ES shorts ~ 38/9? Wow, they're quick. Fixed it already. Bulls and Bears are "Nobelmen in some European countries"
No, it was a Dimon top! Good one LOL....actually never thought of it that way...but you're prolly not far off. Man, it took me a LOOOONG time to get that one! I'm going for more coffee. And yes, it was a good one. IB's are desperate to hold the market together until FB prices / is out the door. I won't be surprised to see us equities and eur/usd diverge here a bit so they can provide the illusion of relative stability here. 5 commencing as I type?? CEL is looking like death, I suppose bad earnings?? 19.99%. That way it is still "officially" a bull market. Err . . . green boxes. And, yes, I AM color-blind. Really! You are ES short Katzo? imo don't worry about that, just look a the charts, that is where the answer is. but what do I know. . . . I guess this may possibly be their biggest score of the year. chop zone guys, look at that PTI, very low, no clear direction. 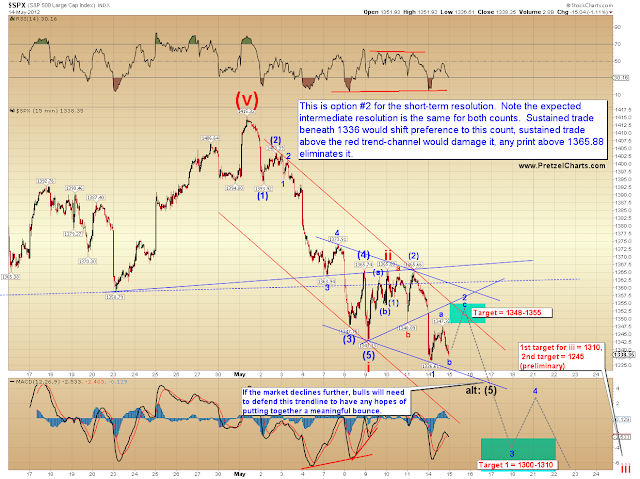 chart implies a 5 but PTI says this EW will break or mrkt will go sideways, I should have been clearer. This is why we wait for TL or MACD line break. We move on to the next victim. Your annotations caused me to begin laughing alot while I was eating a banana. Not a good mixture I'll tell you! "NEW YORK (AP) - Facebook on Tuesday increased the price range at which it plans to sell stock to the public, as investor enthusiasm in the offering continued to mount and boost the potential value of the world's most popular social network. The Menlo Park, Calif. company said in a regulatory filing that it now expects to sell its stock for between $34 and $38 per share, up from its previous range of $28 to $35. At the upper limit of $38 per share, the sale would raise about $12.8 billion.The IPO is expected to be completed late Thursday and begin trading on the Nasdaq Stock Market on Friday under the ticker symbol "FB. "The increased range is a sign of high demand from investors to own a piece of the world's most popular social network. The initial public offering is the most hotly anticipated in years and would value Facebook at more than $100 billion.Facebook is selling 180 million of its shares in the IPO. Another 157 million shares are coming from existing stockholders, including the company's earliest investors and CEO Mark Zuckerberg.Even after the IPO, Zuckerberg will remain Facebook's single largest shareholder. And he will control the company through 57 percent of its voting stock." I get the feeling the market is looking to RUT for direction. So far, it and DJI have held above yesterday's lows. it appears that this is setting up for a substantial fall within two to three hours. The question is 'from what level?' I could see it getting to 1339 es area prior to this possible fall so determining correct entry level is very important. This will be the EW5 move. What do we call long green candles? Anti-Katzos?? This short-chop volatility is untradeable for humans but is heaven for bot traders, who can move in milliseconds based on rules. Down to support and/or turnaround. Up to moving average. I'm talking 50 period Bollinger Bands with simple MA on 5 minute chart. Seems like, already, what was support is now resistance. I played the rise nicely, bottom to top. I am new at this and doing well, but I'm not sure if it's for the right reasons. I am reading PL's blog, reading everyone's comments, forming a strategy, and trading with discipline, but I am not looking at any indicators or charting any waves. I generally only put one trade on per day, but I am profitable on six straight. As Napoleon Dynamite would say "LUCKY". Seriously though, good for you, awesome to hear of successes. That's what I'm worried about. If its purely luck, it will turn eventually. I was getting ready to short SPX with a retest of 1344, but this new HOD gives me pause. Looks like another possible expanded flat. Just went short, I'll cover if it goes much over today's high. Going to bed, GL. Nice, didn't see your post earlier, but this is exactly what I'm seeing in the charts at the moment. i wonder if the 5th wave might extend up? - tricky waves might still have too many leaning the wrong way? Another penetration and another climb up over the trendline on RUT. This thing has got some staying power. Also, $RVX has broken yesterday's lows. I'm about ready to give up on RUT hitting 800 anytime soon, but then I keep in mind that PL said fractals can be strung along alot longer than most people would like. One scenario I'm considering is that the FaceBook IPO on Friday will be enough to propel red wave ii to the target levels and then Greece defaults over the weekend ushering in iii down. But it's all speculation. GL all. Back to work for me. just a side note, the US equity has really decoupled from the European market, Spain's IBEX went below its 2009 low today, and Europeean market has been going down -2% for quite many days while US equities are still floating.Thanks Ben! Looking for one more divergent high around 2 pm. May not happen looks awful weak for "The Bounce"
I like that speculation. I am currently all in cash right now. If the market shoots up high on Friday, I might be tempted to buy some VIX calls and hold it over the weekend; but that is totally against my rule of not holding over night when possible. Internal alarm bells ring off just at the thought of holding long VIX calls over a weekend. I likely will not do it. Instead, if Greece does collapse over the weekend, I will jump in Monday morning for to trade a downward trend. Not predicting -- but would love to see this pattern end in an ED! Another thing to keep in mind is that world governments will do everything they can to prevent a market collapse. So set up yourself to be able to get in and out quickly (twss). INDU 4th wv triangle is supposed to have a sharp thrust down then bounce up. Doesn't look much like that does it, so what gives?? Looks like another triangle shape forming. Que pasa? feel the tension. stop loss bonanza or a short squeeze extravaganza..
INDU Stochastic Mom Index is almost as low as 25th Nov 11 which was followed by 1,000 bounce... Interesting. timing for that potential drop is right about now. . . .
Wow it's astonishing the market still holds considering the US$ rally today...isn't it? Nasdaq held the floor yesterday (only market to do so)... maybe the next drop will be signaled by Nasdaq breaking 2900? That needs to be led by AAPL. HA!! So I was right, Katzos are RED!! Yeah, I guess we have to keep terms basic and understandable. Could always call them "Billas"...that would make the Katzos more satisfying...maybe. Serious job of propping the market here with eur down almost a full penny - a huge move for a currency - and spx basicall flat. Color me impressed. If volume of sellers dries up into the close, MM's will drive this higher...We are going to get a big move one way or the other in the next hour. Would that then be a superkatzo (like supernova)? That's perfect. You really are a funny b@$tard sometimes LOL. and that upgrade to the muthaboard was a definite improvement. WS look at that last hour for the $RVX. That will be the tell here. If it moves to a higher close than yesterday then more coming imo. Utilities are leading the way down? FBI Opens Inquiry Into JPM Loss..... It'll be interesting to see what will happen in the near future. Katzo your red candles were like godzilla going thru Tokyo. RUT head and shoulder break... if the RUT doesn't recover to the 785 area fairly quickly we could see a trip to ~722 over the next week or so.